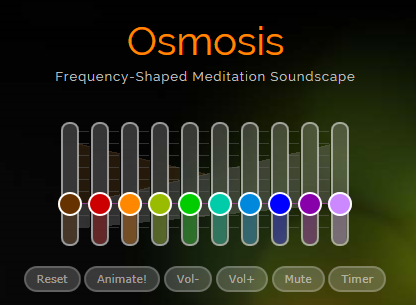 Ambient music fans will love this really cool online meditative drone generator. I stumbled upon this while thinking about composing music to basically guide a 20 minute meditation and was seeing what was out there. In my opinion, there’s still to much going on in this to be useful in meditation, but it is still quite relaxing, and would be nice for sleeping or background while working. It features 10 different tracks of frequencies that you can adjust to your tastes as well as a timer and animation controls. “Each slider controls a particular frequency band, from the lowest to the highest frequency. Adjust sliders to taste. This entry was posted in Anime Music, Technology and tagged Ambient Music, ambient music artists, ambient music blog, ambient music composer brian, ambient music download, ambient music free, ambient music guide, ambient music innovator, ambient music mp3, ambient music no copyright, ambient music online, ambient music pioneer, ambient music pioneer brian, ambient music tutorial, ambient music youtube, generative music, generative music ableton, generative music app, generative music online, generative music software, generative music vst on April 7, 2015 by DemonicSweaters.